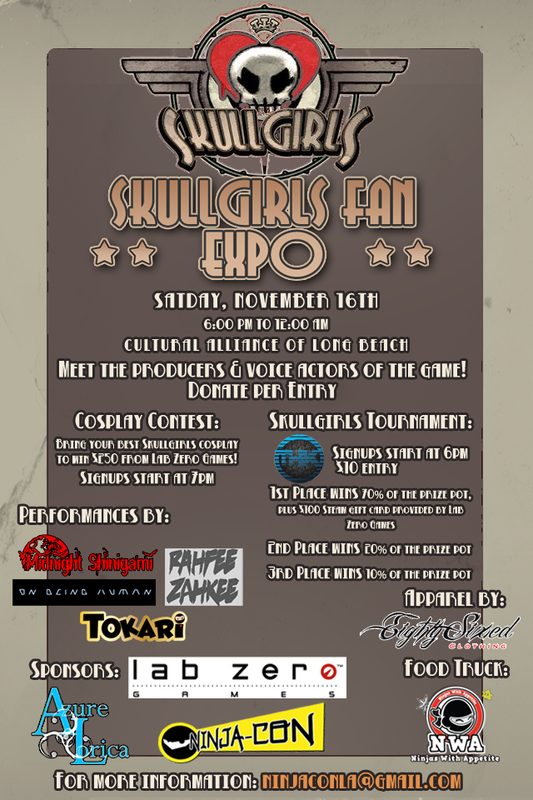 Azure Lorica would like to introduce the world premiere of the Skull Girls Fan Expo! As the sponsor for this event, Ninja-Con has given the newly independent videogame company, Lab Zero Games, a wonderful support in creating their first live exhibit in Long Beach, CA. With performances by Midnight Shinigami, Rahfee Zahkee, On Being Human, and the Tokari Maids, attendees will be able to participate and enjoy live entertainment, music, and food by Ninjas With Appetite all night long! So come and invite your friends, and celebrate your favorite Independent Videogame of the year! Skull Girls Fan Expo will be having a videogame tournament, so please sign up!